I can see three swords in the hand of the father, I see what looks to be a gladius in the center, but the two swords on either side of it do not look to be Roman swords. They resemble scimitars or some such similar sword, not what I would consider Roman. My impression of Roman swords tends to be the gladius and if they used other types I am not aware of them, so are the other two swords Roman? 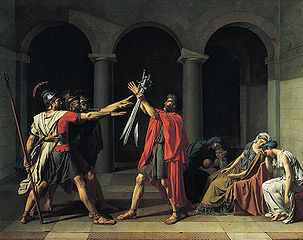 I realize this painting is Neoclassical, although with many of the details look to be very accurate the swords stick out to me as being a sort of artistic license here; but I would like to confirm with anyone who has more knowledge of Roman swords. As for the Roman Military they used a gladius you suggested as their main fighting tool. To back up my answer this site has pictures and summaries of roman weapons etc (None of which seem to resemble a scimitar). The Roman Military was also outfitted with a Spatha which was a much longer sword. With neither of the swords in the picture resembling a gladius in my opinion the only option could be a spatha. A quote from the above linked site. Not the answer you're looking for? Browse other questions tagged art sword roman-kingdom or ask your own question. When did cavalry soldiers unsheathe swords? Did cavalry in China use spears instead of swords? Can anyone help me identify these swords? Why did certain swords have the weird curves that they did?